2. Hold your brush at a 45 degree angle. Begin by brushing the outside of the front teeth. Use gentle, half-tooth wide, back and forth strokes. 3. Next, brush the outside back teeth, starting along the gumline. 4. For the inside back teeth, use short, angled brush strokes. 5. For the inside front teeth, tilt the brush vertically, and use an up-and-down motion. 1. Wind 12 inches (the length of your forearm) of floss around your two middle fingers. 2. Gently guide the floss between teeth. 3. 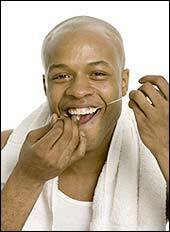 To remove plaque and debris, gently move the floss up and down against the tooth. 4. As you move from tooth to tooth, use a fresh section of floss each time. Most importantly, if your dental professional has given you any special instructions, be sure to follow them precisely.